Don't let geography stand in the way of your career or what’s best for your family. Many companies offer relocation assistance ranging from a flat fee to a comprehensive program. 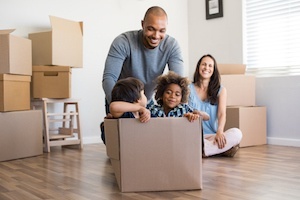 Here are some tips to help you negotiate the best relocation package possible. You probably did some research on the company before deciding you wanted to work there. Now it's time to do a little more investigating. Check with the human resources department to see if the company offers a formal relocation package. Ask about other employees who have moved recently and find out what assistance they received. Network with family, friends and social media to get an idea of what's being offered at other companies. According to a survey by Allied Van Lines, the average relocation package is $21,000 — from a low end of $5,000 to a high end of $50,000. Does the company provide a limited relocation package, or maybe none at all? This isn't the end of the road. Relocation packages can be negotiated just as salaries, benefits and other job perks are. It's difficult to negotiate when you don't know what you're asking for. Give serious thought to what's involved in your relocation and what kinds of assistance will ease the transition. Be sure to think beyond the actual moving process itself and consider other expenses that will be incurred with relocation. Do any of these items apply to you? The broader your range of "wants," the more flexibility you have to negotiate. Companies know that happy employees are productive employees, and having a reputation for treating people right makes them more attractive to job seekers. But they're still a business that has to justify expenses. Show how relocation assistance will benefit both of you. For example, explain how you could begin work at an earlier date if you have temporary housing. Once you commit to a job offer, you lose your best negotiating leverage. And, if a company doesn't care enough to assist you up front, chances are they don't treat existing employees well either. Contracts are intended to protect and bind both parties to an agreement. Don't worry about offending anyone by asking to have the relocation package documented and signed. Our Springs luxury apartment communities can be found in many of the country's more desirable cities. If work brings you our way, stop in and learn more from a friendly member of our on-site management team.